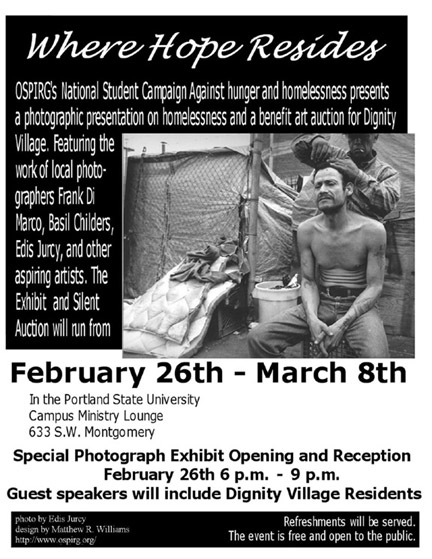 OSPIRG's National Student Campaign against Hunger and Homelessness will be holding a photography exhibit about homelessness and a benefit art auction for Dignity Village. The exhibit and silent auction, called Where Hope Resides, runs from 26th February through 8th March and takes place at Portland State University's Campus Ministry Lounge at 633 SW Montgomery Street. Photographers whose work will be shown and auctioned include the brilliant Edith Jurcy and up-and-coming photographers Frank DiMarco, Stephen Voss and Basil Childers. All proceeds collected will go to Dignity Village's land acquisition fund. Dignity Village, only recently incorporated and awarded non-profit status, is actively engaged in finding its eventual permasite. Speakers at the event's special opening on 26th February include community organizer John Hubbird, chairman of Dignity's village council Jack Tafari, secretary of Dignity's village council Ibrahim Mubarak and others. Topics include Dignity's history and roots, proposed changes in the law and how they will affect Portland's poor, and the war against the poor in general. This special opening takes place at the Campus Ministry Lounge between 6 and 9 PM. There will be refreshments, poetry, there is no cover at the door and everyone is welcome to attend.